I Hear The Bells [C5780] - $13.50 : Yarn Tree, Your wholesale source for cross stitch supplies. Cross stitch pattern by Hands On Design. Jingle bells, jingle bells! Do you hear the bells?!?! Create a short stack drum or a flap jack pillow! Both designs feature bells of different sizes & colors. 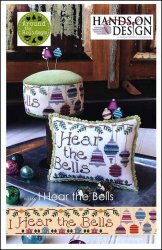 "I hear the bells," is stitched next to the bells. Now, go get your jingle on & stitch away! Stitch counts: Short Stack Drum 32 x 201 & Flap Jack Pillow 80 x 64. A 9 x 10 piece of Pea Pod (#8808) by Lady Dot Creates is included. This is enough to finish the short stack drum OR the flap jack pillow. Lady Dot Algae Chenille (#2311) is used on flap jack finish.